The Greater Charlotte Society for the Prevention of Cruelty to Animals (SPCA) serves the animals and people of Charlotte, NC and the surrounding counties. We are an autonomous organization not affiliated with or supported by any other SPCAs including the ASPCA. We are also not a government-run organization. The Greater Charlotte SPCA is a private 501(c)(3) non-profit. All donations are deductible to the fullest extent of the law. To improve the quality of life of homeless animals through veterinary care, foster care, humane education, and spay/neuter programs. We have many wonderful animals looking for a forever home. Please come out to see our adoptable animals. Hope to see you there! Lend a hand through a variety of volunteer opportunities available throughout the year. The Greater Charlotte SPCA does not own or operate a shelter facility. Volunteers foster all animals in their homes until adopted. Many of our animals come from high-kill shelters and other rescue situations. We find that fostering gives us the opportunity to assess the animal's personality and needs. This allows us to best match them with the right adoptive family. Also, we are able to provide all care and medical needs for our animals. It enables the animal to develop a happy frame of mind before adoption. We have many wonderful animals looking for a forever home. We always need volunteers to help hold our adoptable animals. Let us know if you have some free time to help homeless animals find their forever homes. Looking for a new best friend to brighten up your world? Please come out to see our adoptable animals. Hope to see you there! GCSPCA is always looking for dedicated animal lovers to join us. By donating a few hours a month, you become part of the solution. Lend a hand through a variety of volunteer opportunities available throughout the year. Volunteers are the heartbeat of what we do! 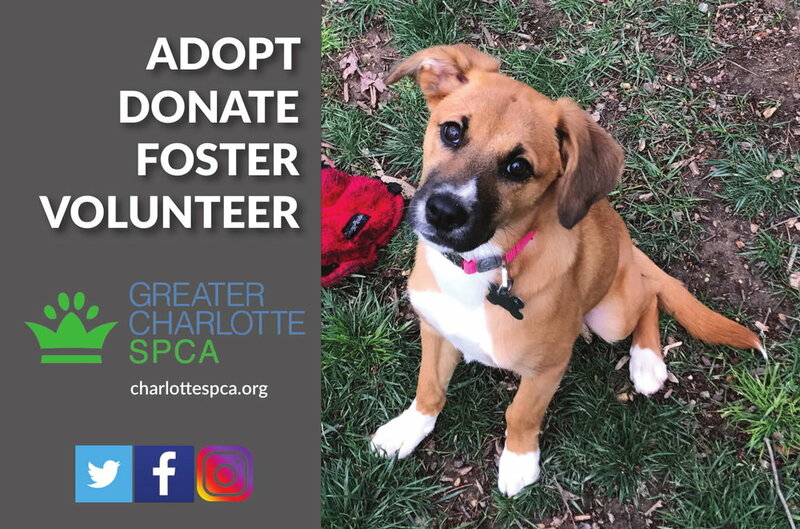 Whether you're interested in becoming a foster home, helping with administrative tasks, planning a fundraising event or participating in upcoming events, your contribution will make a huge impact on the animals in need. Partnership for Pets is committed to improving the lives of companion animals in Charlotte. See how you too can get involved today to make our community a better one for our four-legged friends. For more details, click here. Greater Charlotte SPCA is proud to be a Partner for Pets! BISSELL and LostPetUSA.net have teamed up to help organizations like ours raise money, and now you can help too! When you purchase pet products on bissell.com, enter the code ADOPT and select our organization at checkout, a portion of your purchase will be donated to our organization! For more details, click here. Let your dog play in your leash free zone. CCR Fence makes a donation to Greater Charlotte SPCA for every fence sold. For more details, click here. 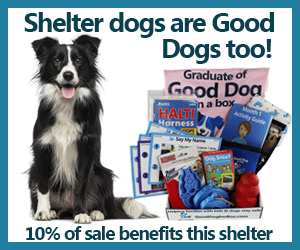 Good Dog in a box is a dog products company with it’s roots in positive reinforcement dog training. We’re a little bit old school mail order, a little bit high tech e-learning, a dash of fun and games, and a pinch of puppy love. We’re in a position to help you improve life WITH and FOR your dog. Happy families with happy dogs means less dogs surrendered to animal shelters. Together, we can make a difference. A portion of your purchase will be donated to our organization! For more details, click here. Unlike some places in America, North Carolina feels the full force of each season that passes. Meaning that for people to live comfortably through the scorching heat and the bitter cold, they must have reliable HVAC appliances and service. At Prime Comfort, that’s our specialty. We are a full-service heating and air conditioning contractor. For more details, click here. The Original Relocation Guide publishes free magazines designed to make your move more enjoyable and less stressful. Thank you Relocation Guide for our ad. For more details, click here.